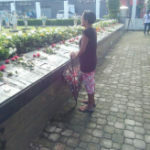 Herminigilda Nilo has been paying her respects to her former employer, Dolores Caballero, who died due to Yolanda and among those buried in a mass grave in Palo, Leyte. TACLOBAN CITY- It was beyond one’s imagination and strength to bury 11 members of your loved ones in a single burial ground. But this was exactly what happened to the family of Dr. Clara Rose Brit whose mother, two siblings, cousins, nieces and nephews were killed during the onslaught of super typhoon ‘Yolanda’ five years ago. Aside from the 11 members of her family, 21 others were also buried in the same burial ground measuring 12×10 meter located inside their compound in Barangay Salvacion, Palo, Leyte. The 21 others were either their neighbors or just swept away at their place due to the impact of storm surge. They just buried them with the knowledge and consent of their loved ones. Brit said that aside from her mother, Remedios Zabala who was placed in a body bag, all those buried were just wrapped with clothes. “We lost practically 50 percent of our family members because of Yolanda,” she said. Among those buried were Brit’s grandmother Catalina Zabala at 86 years old the oldest, and Liam Monserate who was only five years old and youngest; and two pregnant women. Inside their sprawling compound are five houses composed of 22 individuals at that time of the massive disaster. She said that they decided to bury their loved ones inside their compound, aside from the chaotic situation at that time, as it would just be easy for them to ‘visit’ them at any given time or day. “It’s been five years now and though it still pain us so much, we have learned to accept on what happened to us. We still sorely misses them,” Brit’s elder brother, Archie Zabala, 50,said. The family marked the fifth year of the death of their loved ones with a Holy Mass on Thursday (Nov.8). And since 2014, it become a tradition of the clan to hold a Holy Mass on every 8th day of the month. Yolanda pummeled Leyte and major parts of Eastern Visayas on the morning of November 8,2013 that resulted in the death of more than 6,000 people. For Herminigilda Nilo,64 of Barangay Quinapondan, also in Palo, she will forever be grateful to her former lady employer, Dolores Caballero, who died during Yolanda. “I always come here and visit her since 2014. She was good to me and my family,” Nilo said. Caballero was one of the more than 500 storm fatalities buried in a mass grave located inside the compound of the Palo Cathedral which was visited by Pope Francis during his visit in Leyte on January 17,2015. She lit a candle and offered a silent prayer to her former employer of 22 years. She still works with Caballero’s daughter, Salvacion, as a house helper. “After five years after we were devastated by Yolanda, we should be thankful to God for being alive. We still have a mission in life why we survived. Those departed have ended their earthly lives. But we should not forget them as they were part of our lives,” Quejada, who presided a Holy Mass at the said grave yard, said.